1. Don’t short-sell any real estate unless it is your primary residence. A short-sale occurs when your mortgage company agrees for you to sell your home for less than you owe on the mortgage, and they forgive the difference. If you do short-sell, the IRS will assess income tax on the amount of debt which the mortgage company is forgiving. This income tax debt cannot be discharged in bankruptcy, at least for many years. Instead of short-selling, it is much better to simply file for bankruptcy and discharge the mortgage debt altogether. 2. Stop using your credit cards, and stop paying them, until you talk to me. Most people file bankruptcy long after they should, based on an unrealistic hope that somehow things are going to get better. 3. Be aware that if you “settle” your debt with a creditor for less than you owe, the creditor will report this to the IRS, and you will owe income tax on the amount that has been charged-off. In addition, your credit report will show the settled debt as a charge-off, not as paid-in-full. All those debt relief ads you see on TV never mention this. Most people with problem debts are usually far better off simply filing for bankruptcy and discharging the entire debt altogether. 4. Don’t file for bankruptcy without an attorney. This will cause a lot of trouble and it is worth it to pay an attorney to help you. I am frequently hired by people who have already filed for bankruptcy on their own, after they realize they don’t know what they are doing and that the bankruptcy court is not going to hold their hand and lead them through the process. It is far better for you to allow me to file bankruptcy for you in the first place, than to have to try to clean-up your mistakes. 5. Don’t try to hide assets from the bankruptcy court. Anything that is a matter of public record or is registered will be discovered. There are severe penalties for lying on your bankruptcy papers. 6. Don’t spend a lot of time trying to find the cheapest bankruptcy attorney. The cheapest is never the best. Most bankruptcy attorneys charge similar fees anyway, as their fees are limited by the bankruptcy court. Base your decision on the attorney’s qualifications and experience. Filing bankruptcy is a complicated process. 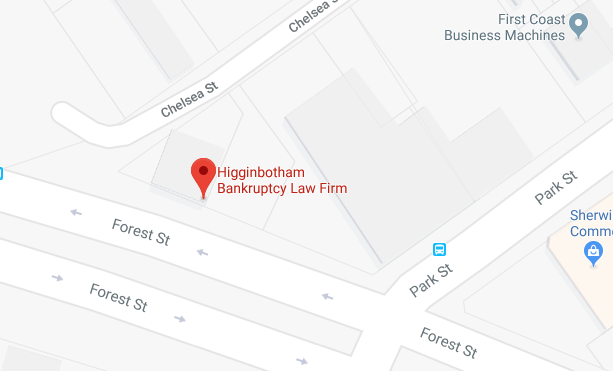 Call me at 904-354-6604 or contact me by e-mail at Higginbotham Bankruptcy Law Firm of now to set up your free consultation.